Sign up at Spinzilla Casino on our site to be able use the promos and coupon codes listed below. Cashout Time: Credit and Debit Cards 4 – 7 days, e-wallets 4 – 7 days, wire transfer 7 – 10 days, cheque 5 – 8 days (UK) up to 30 days (international). Spinzilla Casino is a 100% secure, no-download online casino offering 24/7 customer support, 95% real payouts and offers an array of casino games including a giant selection of slots and an ever-growing mobile casino. The casino is regulated by the Gibraltar Regulatory Authority and the UK Gambling Commission. With over 260 slots, you’ll have no problem finding a genre or theme that suits your interest, especially when many of the titles come from world leading software developers like WMS, NetEnt and Rival. Promotions are another golden feature of spinzilla.com. With a no deposit bonus, first deposit bonus and Daily Specials among others, there is always a way that you can give your bankroll a boost at this iGaming destination. Spinzilla is all about delivering slots variety. As such, it should come as no surprise that this online casino’s games are powered by various software developers instead of being a one-developer show. Rival, NetEnt, 888 Gaming, IGT, WMS, Amaya, Eyecon, Lightning Box and DragonFish are behind Spinzilla Casino games entertainment. Popular slots at Spinzilla online casino include: Aloha! Cluster Pays, Gonzo’s Quest, Millionaire Genie, Rainbow Riches, Starburst, Jimi Hendrix and Jack Hammer 2. As for its other virtual casino games, it has a small selection of under 20 games that include Blackjack, Roulette, Asteroids, Tens or Better, Texas Hold’em, and Keno among others. In addition there is a small selection of scratchcards. A live casino option was not available when this Spinzilla Casino review was created. Be that as it may, all games can be accessed instantly and a Spinzilla Casino mobile version can be accessed via Android smartphones and tablet as well as iPhone and iPad. 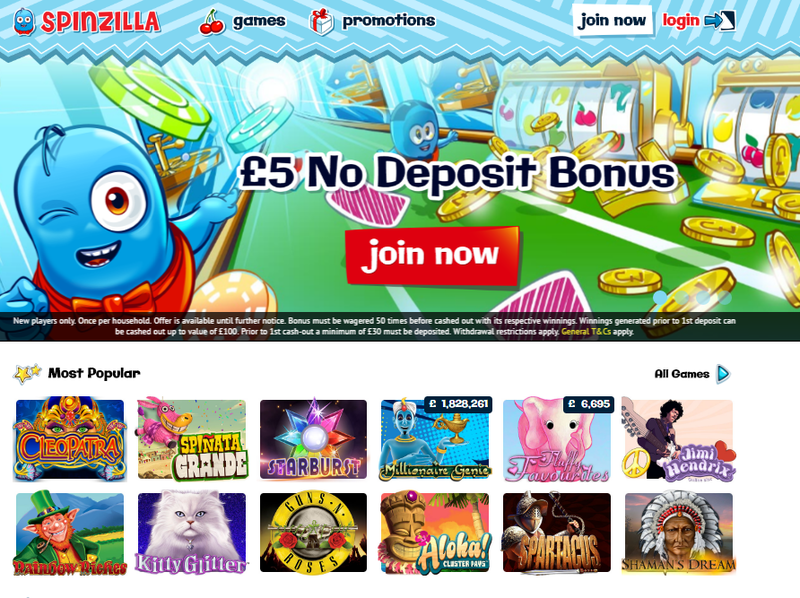 Start your playing experience with a £5 No Deposit Bonus, which you’ll receive upon registering an account. Log in at Spinzilla Casino and make your first deposit and you can enjoy a generous welcome offer of a bonus up to £100 and 10 Free Spins on the Magical Forest slot. Terms and conditions apply. One of the downsides of a Spinzilla Casino bonus is that they are attached to hefty bonus wagering requirements of 50x. This is a far higher wagering requirement compared to many other online casinos that typically offer anywhere from 25x to 40x on welcome offers. There is also £500 Deposit Bonuses + Free Spins, which gives players the chance to take advantage of 5 bonuses and free spins rewards over 5 deposits. Daily Specials is another great promotion that lets you take advantage of a different offer each day from Monday to Sunday. Refer a Friend and Loyalty Points are also available for players looking to get extra bonuses and perks. You can expect secure and reliable deposit and withdrawal methods at Spinzilla. That said, while deposits are quick, withdrawal processing times are not the fastest compared to other online casinos. Most payment options, including e-wallets, take between 4 and 7 working days to process. The accepted currency at Spinzilla is GBP. Deposit methods include Visa, Visa Debit, MasterCard, Maestro, Neteller, PayPal, Ukash, and Paysafecard. Each of these methods, except for Ukash and Paysafe card can be used for withdrawals, as well as wire transfer and cheques. 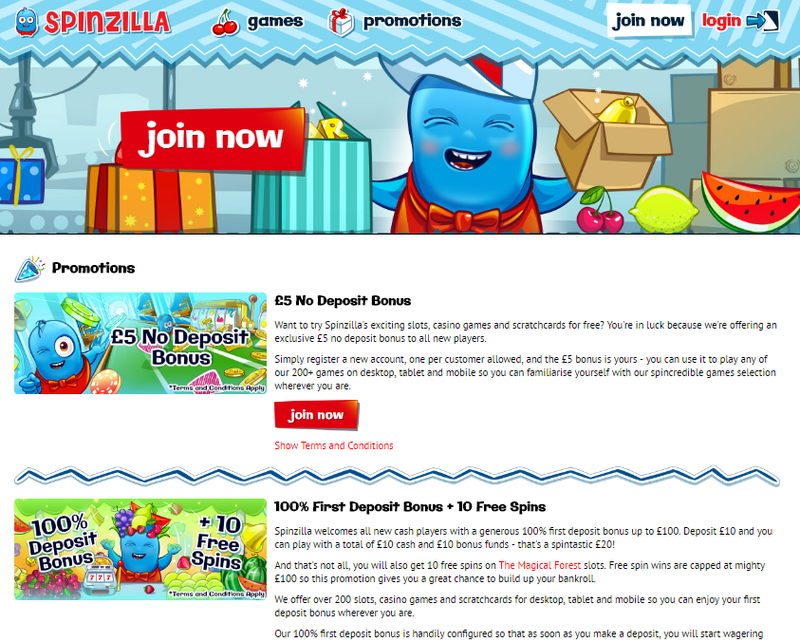 Spinzilla Casino online support includes email and telephone. Unfortunately, live chat doesn’t seem to be an available option, which is a little disappointing. That being said, on the plus side their customer support is available 24/7 and if you live in the UK, the phone number is free. Spinzilla Casino has supported play on mobile platform, you just hold your smartphone at the image area to get the direct link to Spinzilla Casino on your mobile. Spinzilla Casino has restricted from United States, but you can choose another casinos to play from your country.